This is a great picture, Jennifer! Good job. Oh, so great to see you are back, jennifer :))) with brilliant artwork, superb!! 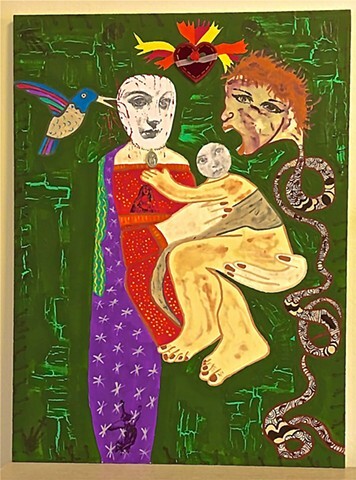 Madonnas and child with snake -- an item from the Mary's iconography. And then there's the potential but unknown symbolism of all the other components. I don't know if that's what you were most interested in, Jennifer, but it's an aspect that fascinates me. A fantastic work of art, Jennifer! Hello Jennifer, I always learn something new from you! I had never heard of crackle paint before! :) Anyhow, love the color composition in this one. Is that you in the top right? A wonderful and touching work! A beautiful country, mixed with the poor people trying to get ahead, a country exploited by the west, and a country of drugs, violence and corruption. This country has progressed, but slowly! A beautiful and colourful representation of a peoples trying to emerge, to take its place among all! Such a beautiful and creative painting, Jennifer! Great symbol .... and beautiful job, Jennifer ! All those rich colors are terrific in this great composition, Jennifer! Tout est parfaitement illustré ...! love this artwork! my best wishes dear Jennifer !